Adventurer, one of Newminster's good sire sons, was a slow-maturing stayer that won some good races. He was fortunate to fall into the hands well-respected horsemen when he retired from the turf, and his reputation as a sire was made when a Derby-winning son and a handful of good juveniles emerged from his first crop, most of which consisted of foals from poorly or non-performing and unfashionably bred thoroughbred and half-bred mares. Soon Adventurer was receiving high-class and well-bred mares, such as St. Leger winner Caller Ou, and One Thousand Guineas winner Repulse. He was leading sire in England once, and second twice, and seldom out of the top ten. Although his branch of the sire line did not persist, he was a successful sire, especially of fillies, of which two were multiple classic winners, and it is through his daughters that he is seen in pedigrees today. Adventurer (1859) was out of Palma, by Emilius, a Rawcliffe Stud mare that had not produced anything particularly successful on the turf with more than half a dozen foals on the ground. He was purchased by J. Gilby as a yearling. Of all of Newminster's sons, he was the one who most resembled his sire, but even so, he did not inherit Newminster's height, showing "unmistakably the Emilius tendency to shortness," and he had greater length above his knees and "remarkably straight" hocks, and so was much more on the leg than Newminster. His sole defect, according to one turf observer, was that his pasterns were "a trifle long." He was described as having a beautiful head, and he moved, they said, "as if he was on wires." The manager of Sheffield Lane Paddocks, where he went to stud, noted that "he was blessed with a delightful temperament." Gilby placed Adventurer with James Watson, who had a public training stable at Richmond in Yorkshire; he was not a good juvenile runner. He won his first race, the Kingston-upon-Hull Stakes for all ages over six furlongs at Beverley by four lengths, beating seven mostly older horses, but after that, in five races at minor venues, the best he could do was third to Longshot in the Zetland Plate handicap for all ages over four furlongs at Richmond. His record was one win and one third placing in six starts. He was likewise useless at age three, running at Catterick, York and Stockton; his best was a third in the Hornby Handicap at Stockton in three starts. At age four he stepped up to win some important distance races, proving to be one of Newminster's stoutest sons. His wins that year started with Doncaster's Londesborough Plate handicap (5 furlongs-152 yards). At Epsom he won the City and Suburban Handicap (1-1/2 miles). After the race he was purchased by Alfred Kruckenberg on behalf of George Crook, and ran in the Great Metropolitan Stakes the next day, but was unplaced. At York Spring, running for George Crook, he won the 2 mile Great Northern Handicap, beating the good race mare Queen of Trumps and seven others, and the next day picked up the 1-1/4 mile Flying Dutchman Handicap carrying 14 pounds more than the rest of the seven horse field. At Epsom in May he won the 1-1/4 mile Craven Stakes, beating a good field of nine others. At Ascot he took the two mile Ascot Gold Vase, also carrying a 14 pound penalty, beating Wingrave, Atherstone and five additional horses. At age five he won the Fitzwilliam Stakes at Doncaster, and then was retired from the turf, considered a "not quite first class" racehorse. He had won eight of his seventeen starts over four seasons. Adventurer was purchased by John Johnstone and Robert Jardine for 2,500 guineas and was "worth every shilling from his quality, breeding, make and shape and action." 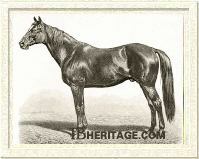 He was sent to their Sheffield Lane paddocks (near Sheffield) in 1865, joining the stallions Warlock and Colsterdale. His initial fee was 25 guineas, and in his first couple of seasons he did not get the cream of England's mares; in addition to thoroughbreds, he served half-bred hunter mares at 3 guineas each. But, one of the mares who visited him that first season was liveryman William Sadler's Venison daughter, Ferina, an old, unraced mare that had produced one dead foal and had been purchased by Sadler for a low price. Four years later her Adventurer bay colt, PRETENDER, won both the Derby and the Two Thousand Guineas, and that year Adventurer also had seven juvenile winners, following up on his first crop, juveniles of 1868, where he had three winners. Within a very few years he was getting visits from some high-class mares with premium bloodlines. By the mid 1870s Adventurer's fee was 100 guineas, elevating him to the ranks of the most popular stallions, such as King Tom, Hermit, Blair Athol, and Parmesan. His book was almost always full before the season began. In 1869 he was third on the leading sires list, behind Thormanby and only a couple of hundred pounds in winnings behind his sire, Newminster. After that, and until his death in May of 1882, he was only once out of the top twenty sires, and usually in the top ten, heading the list in 1874, and second twice, in 1879 and 1880. His youngsters were described as "not very taking as foals, most of them inclined to be gawky, three-cornered and coarse, with large joints and bone generally, but they soon lose their angularity and fine down and fill out in time, framing out into handsome yearlings, but still not altogether of the Newminster type." Jardine once noted that Adventurer's stock were "either very good or very bad, so you always know where you are...If you have a good one you are all right; if a bad one you go to no expense with it." Adventurer's first crop included the versatile ARGYLE (1866, from the Irish mare Itch, by Birdcatcher), winner in 1869 of the five furlong Portland Handicap at Doncaster and second in the 1 mile-6 furlong Great Yorkshire Handicap; BORDER KNIGHT (1866, from Miriam by Malcolm), winner at age three of the Wynnstay and Hawkeston Cups at Shrewsbury and the Great Autumn Welter Cup at Warwick, and at age four of the Great Yorkshire Handicap and the Brighton Cup, and third in Goodwood's Chesterfield Cup, and PRETENDER. Derby winner Pretender PRETENDER was one of several Adventurer foals that inherited the twisting hind leg action at the walk that his sire Newminster had, characterized as a "bad walker." Bred and raced by Johnstone and Jardine, and trained by Mat Dawson at Tupgill in Yorkshire, he was a pretty good juvenile, winning York's North of England Biennial and placing third in Stockton's Lambton Plate and Newmarket's Middle Park Plate (won by Pero Gomez, receiving 7 pounds from Pretender who was carrying the high impost of 8 st.-13 lbs.). Ridden by "Johnnie" Osborne, he beat Belladrum by half a length in the Two Thousand Guineas at age three, and started favorite for the Derby, winning it by a head from Pero Gomez, who had had interference at Tattenham Corner, lost ground to avoid a collision, and made a heroic effort to be narrowly beaten. The Sporting Times noted "We cannot remember an occasion when the last three furlongs were covered in quicker time than by the leading horses this year." But PRETENDER was already beginning to falter, starting to emit that ominous whistling noise that precedes roaring and eventually develops into a crippling lack of breath. Despite this, at Stockton he won the Great Northern Leger (beating Musjid's son Islam), but couldn't place at Doncaster in the St. Leger or in the Doncaster Stakes (both won by Pero Gomez). He was able to rally in the last race of his season, to place second to Boulogne in the Newmarket Derby at Newmarket October. He ran a few more times for two seasons, never placing, and descending into plater company, which, combined with his roaring, did not make him a prime stallion candidate. PRETENDER started his stud career at Fairfield Stud in York at a fee of 15 guineas and was later transferred to stand alongside his sire at Sheffield Lane Paddocks, but he was poorly patronized, even with a low fee, and died in 1878, four years before his sire, leaving nothing of note. Ruperra J.H. Houldsworth's chestnut RUPERRA (1876) was out of the unraced Lady Morgan (by Thormanby), a half sister to the dual-classic winner Marie Stuart. Lady Morgan also produced Morganette (by Springfield), that became the dam of Epsom Derby winner Ard Patrick and English Triple Crown winner Galtee More, both later good stallions. RUPERRA was a good juvenile that won Ascot's Biennial by three lengths and Newmarket's July Stakes in four starts at age two. At three, not quite first class, he failed to place in the Two Thousand Guineas and Epsom Derby, but won both the Great Yorkshire Stakes (beating the great WHEEL OF FORTUNE) and the Doncaster Stakes, and ran second in the Prince of Wales's Stakes, the Doncaster St. Leger (won by Rayon d'Or), the Sussex Stakes and the Grand Duke Michael Stakes. At age four he failed to place in Ascot's Royal Hunt Cup, and was beaten by a head by Thurio in Windsor's Alexandra Plate, his only starts. In 1883 RUPERRA was purchased for 3,000 guineas by Ivan Szapáry for the Hungarian imperial Kisbér stud. Initially he wasn't well patronized; breeders did not care for his "weak loins." But some of his foals were big, strapping, attractive youngsters and his patronage increased; his potential was cut short when he died in 1889 of a twisted gut. In 1885 he got Rajita Rajita, winner of the Szent Laszlo dij Budapest and Oesterreichisches Derby, and Achilles, born in 1888, won both the Magyar St. Leger and Oesterreichisches Derby. Also used as a half-bred improvement stallion, some of RUPERRA'S earlier notable half-breds included Rücken and Lenden. He had an important influence on the Kisber Felvers: an unnamed daughter (1884) was the dam of Deutscher Michel III, a Kisber Felver stallion whose descendants included Fenek (1960) a sire of Dutch warmbloods, and Shannon IV, the dam of international show jumpers and eventers. Several of his thoroughbred daughters bred on, producing winners. His daughter Szende (1889) had a female line that went to Russia -- the Hanoverian stallion Pavarotti (2003) descends from her. RUPERRA'S classic-winning son Achilles got Kranach, a useful stallion in Hungary that was used as an improvement sire at the imperial stud at Bábolna, where he got Anglo-Arabs that bred on. Adventurer's other good running sons that won important races included ENTERPRISE (1867, Vimeira by Voltigeur), who dead-heated for first in both the Doncaster Stakes and the Stockton Handicap in 1870; the Irish-bred SPECULATION (1869, Verbena-Slane), winner of the four mile Royal Whip at the Curragh at age three; DUNOIS (1869, from the half-bred mare Petra, by Tadmor, H-B Family 10), winner of six races on the flat, three hurdle races, and eighteen steeplechases in 127 starts; CHIVALROUS (1870, Auld Acquaintance by Birdcatcher), who took York's 1-3/4 mile Great Ebor Handicap at age four; Pirate (1870, Kate Dayrell by Wild Dayrell), winner of the 1 mile-6 furlong Great Yorkshire Handicap at Doncaster; BLANTYRE (1871, Bonny Bell by Voltigeur), who took the 1874 Liverpool Summer Cup; GLEN ARTHUR (1874, Maid of the Glen by Kingston), winner of a number of races including the Prince of Wales's Stakes at Ascot over 13 furlongs, and second in the 1877 Epsom Derby; SIR AMYAS LEIGH (1876, from Muddle by Moulsey), who won the Seaton Delaval at Newcastle as a juvenile; BONNIE DOON (1877, Bonny Leith by Rataplan), winner of the two mile Northumberland Plate at Newcastle; PRIVATEER (1878, La Favorita by Thormanby) who took two races at Goodwood and the Great Northern Handicap at York; ISHMAEL (1878, Lina by Stockwell), a consistent high class runner for his owner-breeder Robert Jardine that won the Great Yorkshire Stakes at age three, the Liverpool Summer Cup at age four and the 2 mile Ascot Stakes at age five; and BORNEO (Lady Lucas by Tynedale), winner of the 1-1/2 mile Manchester Cup. 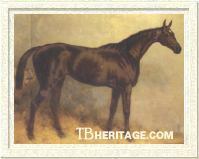 MILITANT (1874, from Milliner by Rataplan) won the 1879 Scottish Grand National Steeplechase. SCHWINDLER (1872, from Mineral by Rataplan), who was imported in-utero to the Kisber Stud in Hungary, won the Union-Rennen and dead-heated for the Deutsches Derby in 1875. None of these horses were especially good sires. ARGYLE got some good half-bred winners, including Carsethorn (1880, from Red Hind by Bredalbane), a winner of seven races worth £733, had some success as a broodmare sire: his daughters produced Cambridgeshire winner Indian Queen (1891, from Oriental Girl), Gimcrack Stakes winner Royal Stag (1888, from an unnamed daughter), and Manchester November Handicap winner Lexicon (1894, from Loch Linnie). SPECULATION, in Ireland, and got hunters and some winning jumpers, including the steeplechaser Cork (1881) that won the 1886 Conyngham Cup for John Gubbins, and was dam's sire of Carnage (1893, by Gallinule), a moderately good juvenile winner in Ireland that later got some winners. GLEN ARTHUR went to stud at Rosnashane (Antrim) in Ireland; he became dam's sire of Aborigine (1890, by Exile), winner of the Ascot Stakes and Queen Alexandra Stakes (2 miles-6 furlongs, also at Ascot). 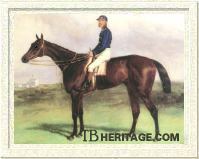 PRIVATEER got Lord Rosslyn's Buccaneer, a winner of the 1892 Ascot Gold Cup and other races. SPORTSMAN (1877, out of Sporting Life by The Prime Minister), winner of the Newmarket St. Leger and the Edingburgh Gold Cup, went abroad, imported into South Africa by Charles Southey, where at the Culmstock Stud he got a number of winners. Even in his own time Adventurer was acknowledged as a superior sire of fillies, and later a successful broodmare sire. His first really good daughter was AGILITY (1867), from Mandragora by Rataplan. Mandragora was out of Manganese, by Birdcatcher. "The Flying" Manganese, a brilliant juvenile winner of ten of her sixteen starts, had won the One Thousand Guineas in 1856. She was trained at Ashgill, near Middleham in Yorkshire by John Osborne, Snr., and ridden by his son "Johnny" Osborne, later also a successful trainer at Ashgill. She was co-owned by Osborne Snr. and Reverend John William King, a "sporting parson" and fourth son of Col. Neveille King of Ashby Hall, Lincolnshire. The Reverend, who held livings at Ashby de la Launde and Bassingham, unexpectedly inherited Ashby Hall and his father's stud after the deaths of his three elder brothers. Due to Victorian sensibilities, the Reverend raced under the name "Mr. Launde." He bought out Osborne's share in Manganese after the Guineas win, and she retired to his stud; she, and some of her daughters were bred to Adventurer in various years. Her first foal was the filly Mandragora (1860), followed by Great Yorkshire Stakes winner The Miner (1861), Skirter (1862, by Skirmisher) and Mineral (1863, later dam of St. Leger winner Wenlock, and at the Kisber Stud in Hungary of German Derby winner SCHWINDLER (by Adventurer), and Epsom Derby winner Kisber), all but Skirter by Rataplan. Manganese's next foal was the chestnut filly Thor's Day (1864), by Thormanby, dam of the brilliant juvenile Holy Friar (1872, by Hermit). Then came another Skirmisher foal, Slanderer (1865), followed by Minaret (1866, also by Rataplan), a smart two-year-old and later dam of Great Yorkshire Stakes winner Mintdrop. In 1867 Manganese dropped the Rataplan filly In Memorium (1867) and in 1869 another Rataplan filly, Milliner, dam of Adventurer's daughter AGENORIA, whose son Pontiac won the Suburban Handicap in the U.S. and then the filly PERADVENTURE, by Adventurer (1871), a tail-female ancestress of stakes winners. Mandragora was a tiny mare, not more than 14.3 hands, but was well-conformed ("handsome as a picture"). She was tried at Ashgill at age two, but was useless and put away for a year; at age three she was tried again and found "not good enough to win a bridle at a fair." Retired to the stud -- Osborne convinced King to keep her because of her bloodlines -- she produced three foals in succession: Mandrake (1864, by Weatherbit, a winner of the Doncaster Cup and Great Ebor Handicap, probably the best 4 year old of his year), Skedaddler (1865, by Skirmisher, unplaced in one start), MISADVENTURE (1866, sold to Mr. Pryor and won small races as a juvenile) and AGILITY (1865), both by Adventurer. In 1869 she dropped a Mouslsey filly, Muddle, a minor handicap winner, and in 1871 another Adventurer filly, APOLOGY. Her next live foal was the Adventurer filly ANALOGY (1874), and in 1877 her last foal, Napsbury, by Scottish Chief (later a winner of the Great Yorkshire Stakes). Both AGILITY and APOLOGY were excellent runners, and ANALOGY, sold to France as a yearling, became the dam of a grand stayer and good stallion, Elf. Agility AGILITY, described as "varmity," having "common quarters and a drooping tail," did have a good shoulder and her sire's depth of girth. Owned by the Rev. King and trained by John Osborne (Jr.), she won 21 of her 53 races in four seasons on the turf. As a juvenile she won Newcastle's Seaton Delaval Stakes, beating a good field, the Tyro Stakes, and the Nottingham Biennial. At age three she won the Zetland Biennial Stakes at Stockton in a canter,the York Cup (beating Rosicrucian), the Warwick Cup, Goodwood's Nassau Stakes, Doncaster's Park Hill Stakes (beating Oaks winner Gamos), and dead-heated with Enterprise in the Doncaster Stakes the afternoon after winning the Park Hill Stakes. Her last race at age three was a win by 1-1/2 lengths in a free handicap at Newmarket Houghton, beating Falkland while conceding him 6 pounds. At ages four and five AGILITY'S wins included Stockton's Claret Stakes for 4 year olds, the York Cup again (beating Albert Victor by a head), and Queen's Plates at Shrewsbury, Chester, Manchester, Newcastle, Carlisle and Lichfield. She broke down at age five during the running of the Queen's Plate at Edinburgh. AGILITY was purchased for £3,000 by Clare Vyner, a Yorkshire sportsman who had some horses with the Osbornes and some with Mat Dawson at nearby Brecongill; he would own one classic horse, Camballo (by Cambuscan), a Two Thousand Guineas winner. AGILITY had only four seasons in the stud before dying. Her daughter Lizzie Lindsey (1877, by Scottish Chief) produced Crowberry,who ran second in the Epsom Derby and the Grand Prix de Paris, and was later the sire of the half-bred King Crow (1894, H-B Family B2), a good stayer that won six races, including the Great Northern Handicap, the Northumberland Plate, and the Manchester Cup and was later a sire in Yorkshire. AGILITY'S daughters bred on, with tail-female stakes winners in many countries. Apology AGILITY'S chestnut sister, APOLOGY (1871), was an even better runner. She was owned by King, and trained by Osborne at Ashgill, and, like her sister, was not considered a particularly attractive animal, although a big, powerful "slashing" one with a 4 foot-5 inch girth and 15.2. hands height. She inherited the "bad walk" of her grandsire, Newminster. She was not good as a juvenile, but she showed promise. She was third to Atlantic, later a leading sire in France, and Regal, who would win the Grand National Steeplechase three years later, in Goodwood's Ham Stakes. She did not place at Stockton, both she and future Derby winner George Frederick were unplaced in a juvenile race at York, and in the fall she was beaten at Doncaster by George Frederick. At Newmarket Houghton she won the Home Bred Produce Stakes, beating Blanchfleur and AVENTURIÈRE. She came out favorite for the One Thousand Guineas, and won it easily by half a length. In the Oaks she beat the favorite, Miss Toto, without problem by three lengths. At Ascot she easily won the Coronation Stakes. She was supposed to run in the Yorkshire Oaks, but was slightly lame; in the Great Yorkshire Stakes, she was second by a head to "the pony" Trent on hard ground. She came to Doncaster the first favorite for the St. Leger, George Frederick having been scratched, but in a workout showed some lameness, and with wild rumors flying around the course, the odds began to change. But APOLOGY, ridden by Osborne, easily won the race by 1-1/2 lengths in the fastest time to that date, to the wild enthusiasm of those who had stuck with her in the betting, and she lost mane and tail hairs in the paddock, plucked by wildly enthusiastic fans. Leolinus and Trent were second and third, with the remaining ten horses including Atlantic and Rostrevor. It was decided not to run her in the Doncaster Cup. She came out once more that season and was beaten in Newmarket's Free Handicap. In the spring of 1875 King died, and as a consequence Apology did not run until Goodwood, in the meantime having "got big" and out of condition. She did not run frequently or well at all that year, but was finally fit enough at the end of the season to be beaten by a neck in Newmarket's Jockey Club Cup by Carnelion, giving him 6 lbs. In 1876, age five, she went to York to run in the Great Northern Handicap; she was facing a field of moderate runners, and was made favorite, but she could only get up to fourth, beaten by seven lengths by POLONAISE, to whom she was conceding 26 lbs. It was Osborne's opinion that she had lost form because she was not racing enough, her home schools against the lesser horses in the stable not challenging enough to keep her sharp. Since the Ascot Gold Cup was the goal of the season, she was entered in Manchester's Queen's Plate to help get her up for the Cup, run a week later. She won the race by a neck. At Ascot, with Osborne in the saddle, she won the Gold Cup, beating that year's St. Leger winner, Craig Millar, by half a length. Her last race was the Newcastle Queen's Plate, which she won by twenty lengths; at Goodwood, her leg gave way and she was retired from the turf. In all she had won eight races in twenty starts, and a total of £14,445. King's stud had been dispersed in the fall of 1875. Mrs. King retained Apology, but the rest of the family went under the hammer. Mandragora, then age fifteen, was sold to Roger Gee for 3,250 guineas. AGILITY also went to Gee's Dewhurst Stud (later purchased by Clare Vyner at Gee's dispersal sale) for 2,500 guineas. PERADVENTURE, despite bidding to keep her in England, was sold to Sir Thomas Elder of South Australia for 1,250 guineas, where she established a long-lived branch of Manganese's family that included Veilmond (1927 by Limond, AJC St. Leger and VRC St. Leger and seventeen other races), and The Monk (1920, AJC Sire's Produce Stakes, VRC Ascot Vale Stakes). Veilmond was later a successful sire in New South Wales, especially of stayers. After she was done racing, APOLOGY became a broodmare in Clare Vyner's Fairfield stud, but produced nothing like herself. Her son Juventus (1881) won the 1883 Gimcrack Stakes. Esterling (1882, by Sterling), a handsome colt, won Newmarket's Craven Stakes, but having injured his shoulder and regularly lame, could not train on. Esterling was later a stallion at Moorlands Stud in Yorkwhere he got the 1894 Great Yorkshire Stakes winner Koran and Grace Conroy, a moderately good juvenile runner (winner of Leicester's Knighton Plate and second in Ascot's New Stakes, Goodwood's Lavant Stakes and the Fulbourne Stakes at Newmarket, at age three winner of Hurst's Stewards' Handicap). Grace Conroy was later the second dam of Consols, winner of nine races, and later sire of the French champion stayer and stallion Massine (1920). Esterling was also dam's sire of the stayer Airship (1901) and the sprinters Solicitor (1898) and Billy the Verger (1904), both winners of Ascot's 7 furlong Royal Hunt Cup. APOLOGY was shot in 1888. A third Adventurer daughter from Mandragora, the unraced ANALOGY (1874), was purchased as a yearling by the Comte de Berteux and sent to France. At age nineteen she became the dam of Elf (1893, by Upas), an outstanding distance runner that won the Prix Gladiateur (6200 meters), the La Coupe de Paris (twice), and the Prix Rainbow (then the Grand Prix de l'Imperatrice, 5000 meters, twice), and in England the Ascot Gold Cup. In France Elf got some good horses, including the champion French runner Sea Sick (1905), French Oaks winner Rose Verte, Nimbus, Tripolette, and other good ones, as well as winners over jumps; he was second on the French leading sires list in 1913. Adventurer's daughter AVENTURIÈRE (1871, from City and Suburban handicap winner Cantine by Orlando), bred and raced by Lord Ailesbury and a half-sister to Hungerford, was another excellent stayer, trained by Alec Taylor. Among her other wins at age three she took Goodwood's Nassau Stakes, the Gratwicke Stakes, went on to take Doncaster's Park Hill Stakes, and in the fall won the Cesarewitch at Newmarket (2 miles-2 furlongs). The next year her wins included the Goodwood Cup (2 miles-5 furlongs), but she could only place second in the Ascot Gold Cup, won by Doncaster by six lengths. BAL GAL (1878), was an Adventurer filly from Cantinière, a daughter of Cantine, and so closely related to AVENTURIÈRE; she was owned by Lord Falmouth. Cantinière had been an outstanding juvenile, winning six of her seven starts, including Epsom's Woodcote Stakes, Goodwood's Lavant Stakes, and Newmarket's Chesterfield and Hurstbourne Stakes. BAL GAL was also a brilliant juvenile, taking eight of her nine starts, including Goodwood's Richmond Stakes and Rous Memorial Stakes, Newmarket's Dewhurst, Clearwell, Rous Memorial and July Stakes, York's Prince of Wales's Stakes, and the Doncaster Champagne Stakes. Her half-sister, Lord Falmouth's Dutch Oven (1879, by Dutch Skater), was another good two-year-old that later won the Doncaster St. Leger and Yorkshire Oaks. Not an immediate success as a broodmare, BAL GAL did have tail-female descendants that won, including 1919 Prix du Jockey Club winner Tchad. Wheel of Fortune with a foal by Ayrshire Another star filly by Adventurer was WHEEL OF FORTUNE (1876, from the famous Queen Bertha by Kingston). Bred and raced by Lord Falmouth, she won ten of her eleven starts, her only loss at the end of her career when she broke down during the running. Her wins at age two included Newmarket's Dewhurst Stakes and Goodwood's Richmond Stakes. At age three she won the One Thousand Guineas, the Epsom Oaks, the Yorkshire Oaks, and Ascot's Prince of Wales's Stakes, but broke down in the Great Yorkshire Stakes, won by RUPERRA, hanging on to place second to him. She was always considered the best Falmouth had ever owned -- and he had a number of classic winners -- and the famous jockey Fred Archer claimed she and Bend Or were the two best horses he ever rode. WHEEL OF FORTUNE was not an immediately successful producer, but after the dispersal of Falmouth's stud she went to the Duke of Portland's Welbeck Abbey stud where she bred Oberon, a Lincolnshire Handicap winner, later a sire in Ireland. Some of her daughters bred on, and had many tail-female winning descendants, especially in Germany. Other good running Adventurer daughters included: LEVANT (1873, from One Thousand Guineas winner Repulse by Stockwell), winner of Newmarket's July Stakes as a juvenile; POLONAISE (1873, Klarinska by De Clare), winner at age three of York's Great Northern Handicap and the 1-1/2 mile Manchester November Handicap; Rozelle (1879, Morgiana by Scottish Chief), winner of Ascot's Coronation Stakes and her sister, Adriana (1880), that won Ascot's New Stakes (Norfolk Stakes) as a juvenile. Rozelle later produced Inverdon, a winner of Goodwood's Richmond Stakes as a juvenile. Adventurer bred a number of successful broodmare daughters, some of them from the modest mares he got in his first few seasons at stud. BON ACCORD (1867, from a Birdcatcher mare) produced Ballyroe (1872 by Belladrum), a filly that placed once in four starts, but in the stud bred the magnificent runner and successful sire Barcaldine and his half-sister, Miss Augusta, the dam of Irish Derby winner Royal Arch. BON ACCORD'S daughters bred on, producing stakes winners in tail-female. Another filly from the same crop, CHANCE (1867, out of Eveline by King Tom), produced Wootcote Stakes winner Cadogan, later a successful sire in New Zealand. Adventurer's daughter STRATEGY (1867, Minerva by Stockwell) went to Ireland, where she produced Anglesey Stakes winner Second Sight, and Madame du Barry, winner of the Irish Derby, the Manchester November Handicap and Goodwood Cup in successive years. Madame du Barry was tail-female ancestress of some good runners, including the outstanding stayer Ardross (1976) and Winston Churchill's post World War II winner Colonist II (1946). Another 1867 Adventurer daughter, PERFORMER (from Olga, by Charles XII), became the dam of Teviotdale, twice winner of the two mile Ascot Stakes; PERFORMER'S daughters bred on with stakes-winning descendants, among which was the Grand National Steeplechase winner Glenside (1902). PEFFAR (1871, by Adventurer from the grand race mare Caller Ou) was the dam of Sweetbread (1879), a sturdy weight-carrier that won Ascot's Royal Hunt Cup and Goodwood's Steward's Cup, among other races, later a modest sire. ADVERSITY (1871, Adventurer - Stockhausen by Stockwell) produced Chippendale (1876, by Roccoco), an excellent stayer that won the Cesarewitch and Ascot's Hardwick Stakes at age three, and the Ascot Gold Vase, the Jockey Club Cup, and Epsom's Great Metropolitan handicap at age four, and repeated his Jockey Club Cup win again at age six. Chippendale got the good filly Silver Spur, winner of the Great Yorkshire Stakes, the Great Ebor Handicap and Kempton's Queen's Prize (1-1/2 to 1-3/4 miles), Merry Andrew, who took the Manchester Cup, Richmond Stakes winner Chillingham, and other winners and some daughters from which some good racehorses trace in tail-female. ADVERSITY also produced Sheraton (1882), a winner of Ascot's St. James Palace Stakes. STONE CHAT (1873, by Adventurer - Furze Chat by King Tom) produced the good staying filly Stone Clink, a winner of the Cesarewitch and Newcastle's Northumberland Plate (2 miles) at age four, and her half-sister Fallow Chat, a winner of the 1-1/2 mile Manchester November Handicap at age four. Both daughters bred on in tail-female and their descendants are still producing winners; the excellent German stayer and sire Ossian (1918) and One Thousand Guineas winner Scuttle were from Stone Chat's female line. 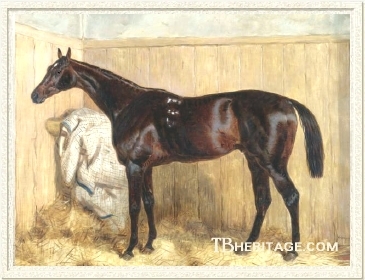 Adventurer's daughter SEA MARK (1873, from Sea Gull by Lifeboat) produced two brothers by Sterling, Stalwart and Topgallant, that went to the U.S. Stalwart was not of much use, but Topgallant was a successful sire of such horses as Algol (Wheeler Handicap and other races) and Sidney Lucas (American Derby). Another 1873 Adventurer daughter, GLEE (from Sweet Sound by Rataplan) became the dam of the good stayer Border Minstrel (1880 by Tynedale), a winner of ten races, including the Ascot Gold Vase and the Goodwood Cup at age three; as a stallion in France Border Minstrel got Prix Kergorlay winner Floreal and some daughters that bred on. Border Minstrel's sister, Melody (1888) won the Woodcote Stakes and the 13 furlong Prince of Wales's Stakes at Ascot, and then produced two good running daughters -- Winifreda, winner of the One Thousand Guineas and Ascot's Coronation Stakes among other races, and Red Lily, a Nassau Stakes winner. 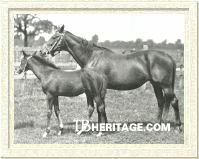 Italian Derby winner and sire Ugolino da Siena, the good French winner Gyr, and Selima Stakes winner Laughing Queen, from which descend some significant American runners, such as Tom Fool, were from Glee's female family. Adventurer's daughter AGENORIA (1876 from Milliner x Rataplan) was bought by Pierre Lorillard and imported in 1880 to his New Jersey Rancocas Stud in foal to Pero Gomez. The foal was Pontiac (1881), winner of Aqueduct's Suburban Handicap. Milliner was also dam of MILITANT (1874) by Adventurer, winner of the 1879 Scottish Grand National Steeplechase. Other Adventurer daughters that produced high-class winners included: NORTH STAR (1874), the dam of Newmarket's Criterion Stakes winner Royal Star (1886); BRIONY (1878, a sister to GLEN ARTHUR), that produced Great Yorkshire Stakes winner Briardale, and daughters that bred on -- the Australian Bernborough, One Thousand Guineas winner Waterloo and Two Thousand Guineas winner and sire Nearula descended from her in tail-female. FLORA MCIVOR (1879, Adventurer - Belle of Scotland by Blair Athol), was the dam of Charles Perkins' Dare Devil (1888, by Robert the Devil), winner of the Chester Cup at ages four and five, ridden by his jockey-trainer James Fagan, and of the Northumberland Plate at age eight. PINTA (1881, Adventurer - Spiegelschiff by Speculum) became the dam of Pinfold, a winner of the Doncaster Cup in 1898. WHEATSHEAF (1882, by Adventurer, from the Stockwell daughter Cognisance) bred Unicorn, a winner of Goodwood's Stewards Cup, and his brother, Alconbury, in Germany a winner of the Grosser Hansa-Preis and later a useful sire, both by Paradox. Adventurer's daughter HOPE (1868, from an Orlando mare) went to Austria-Hungary, where she produced Nil Desperandum (1875) to the cover of Buccaneer; he won both the Magyar St. Leger and the Oesterreichisches Derby in 1878. THRIFTY (1872, by Adventurer, out of Stockwell's daughter Thrift, and so half-sister to Tristan by HERMIT, and other good winners) produced Triftig, a winner of the Furstenberg Rennen in 1885. Another German winner, Anarch (1886) winner of the Mehl-Mulhens Rennen at Koln, was out of the Adventurer daughter ANGELA (1870, out of Stella by West Australian). Adventurer's daughter KLEPTOMANIA (1869, from Gertrude by Hautboy) went to France, where she produced the Stracchino filly Directrice, winner of the Prix Morny, and Reluissant, winner of the 1885 Prix du Jockey Club and the Prix Jean Prat. PRINCESS MAUD (1879, from Princess of Wales, by Stockwell) was imported into Australia by James White of Kirkham Stud, near Fernhill, NSW, where Chester held sway as a stallion. To his cover she produced Acme (1883), a good juvenile that later won the Tattersall's Carrington Stakes and the 16 furlong Tattersall's Club Cup. An excellent broodmare, Acme produced Acmena, an AJC Oaks winner, Acton, a gelding that won Adelaide's Parkside Stakes, and Achray (1894), who was purchased to England where she bred Achtoi, winner of Chester's Dee Stakes and other races and later a sire of classic winners in Ireland. Another Adventurer daughter that went to Australasia was MISS KATE (1873, from Sporting Life by The Prime Minister and so sister to SPORTSMAN), imported into New Zealand at age five by J. Carter of Ashburton. She bred fifteen foals, including Dunedin Cup winner Sultan (1884) and his brother, Prime Warden (1887), a Canterbury Cup winner, both by the good French-bred stallion Apremont. Through her daughters MISS KATE became one of New Zealand's most significant matrons. Her daughter Catherine Wheel (1891, by Maxim) was dam of the champion three-year old Treadmill, second dam of Auckland Cup winner Malaga (1916) and third dam of the great racehorse, Phar Lap (1926). Catherine Wheel was also tail-female ancestress of another one of the greats of Australasia, the outstanding mare Sunline (1995), champion in New Zealand four times, and champion in Australia three times, winner of 32 of her 48 starts. Another MISS KATE daughter, Antelope (1883 by Apremont), produced dual Auckland Cup winner Blue Jacket and was second dam of Persis, a significant foundation mare at Trelawney Stud; the New Zealand champion Kindergarten (1937, winner of 25 races in 35 starts) descended from Antelope. Adventurer daughters were also tail-female ancestresses of the stout American stallion Princequillo (1940) and the French-bred Prix du Jockey Club winner Mieuxce (1933), later a successful stallion and good broodmare sire in England.